Our Goal at Happy Horse Riding School is to introduce you to the wonderful world of horses. If you already ride we'd like to teach you how to enjoy horses more or get along with your own horse better. Happy Horse Riding School is owned and operated by Lindy Cogswell. Located in Burbank Heights at 548 Tuttle Lane. Excellent school horses provided. Vaulting is gymnastics on horseback. This is the MOST fun way to learn to ride. You don't have to be good at gymnastics, everyone is good at gymnastics on horseback. Vaulting gives students an opportunity to develop their rhythm and balance in the walk, trot and canter. It is a fun, safe way to learn to ride or to improve your riding. No experience necessary, appropriate for ages 4 to 18. All children are required to take some vaulting lessons before they start independent riding. Adults will be started in the Seat Period Class. Seat Period Class - Mechanics of the “seat” for beginning adults to establish balance & rhythm. Also appropriate for more advanced students who want to re-establish their positions. Hands & Seat Class - Students learn to groom & tack up the horses before & to cool them out after the ride. Basic position & control is taught at walk & trot. 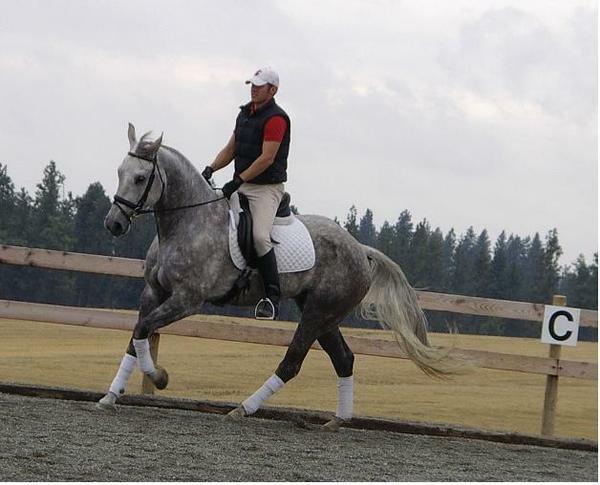 Recreational Riding - Learn to post the trot, jump position, & begin cantering. Jumping & Dressage - Develop basic dressage & jumping skills in preparation for competition. Field Lessons - Riding out in the open on local trails. 2 to 5 hrs $50 to $150 depending on where we go. Day Camps at Happy Horse are a dream come to true for horse lovers. Our goal is to make camp as much like having your own horse as possible. Campers will be assigned a horse to take care of for the week. If you already have your own horse we encourage you to bring him to camp with you. There is no extra charge for bringing your horse, just let us know so arrangements can be made. You will be responsible for feeding the horses lunch, cleaning the stalls and taking care of any special needs they may have.  Unmounted Lesson - Learn all about owning and caring for horses. We use English saddles and you will be learning a basic balanced seat which will apply to any style of riding. Depending on skill level we will be doing jumping, games and riding up and down hills. Vaulting is gymnastics on horseback. This is the MOST fun way to learn to ride!!! You don’t have to be good at gymnastics; everyone is good at gymnastics on horseback! Each day campers will have a vaulting lesson, riding lesson & stable management class. On the last day of camp, during the last hour; we will put on a demonstration for parents & friends.